On his last day as a pediatrician in New Canaan, Dr. Harrison Pierce said he saw a large number of children, four of whom were “second-generation” patients. Yet within hours of retiring, Pierce’s daughter Tara Clough—a 1993 New Canaan High School graduate—called to ask him to check on her own daughter, who had been sick that very night. A fixture since 1975 at the East Avenue doctors’ practice known today as the New Canaan Medical Groups, Dr. Pierce has served as primary care physician to generations of local kids, forging bonds with families here and, through his office as well as wider community involvement, leaving an indelible mark on the town. A New York City native who earned his bachelor’s degree from the University of Notre Dame in 1965 and medical degree from the University of Rome in 1970, Pierce completed his internship, residency and fellowship at New York Medical College and came to New Canaan in 1975. There, Dr. Pierce would enter a profession that he refers to as a “vocation” rather than a career. He retired in December, as announced over the PA by Bob VanDerheyden, “Voice of the Rams,” at the Turkey Bowl. “I think I actually did what I was supposed to do,” Dr. Pierce wrote in a letter to his patient families. Arriving in New Canaan, he joined a practice that included Dr. Thomas Flynn and grew to become an integral piece of New Canaan and dedicated family physician. 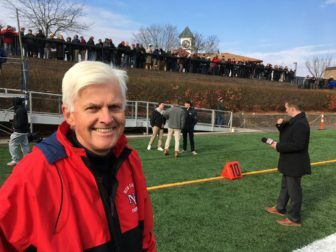 He was the town’s director of health from 2001 to 2003, and could be seen on the sidelines of Dunning Field during the New Canaan High School football season, alternating with Dr. William Flynn as athletic department physician. A father of three (Tara, Harrison and Cecily), Dr. Pierce will continue as medical advisor to the New Canaan Public Schools, New Canaan Country Day School and St. Aloysius School, which requires keeping in “constant communication” with school nurses and occasional visits to the schools for consultations. Retiring is “bittersweet,” Pierce said. Those demands have been substantial. Before the New Canaan Medical Group had a third partner, Pierce said he was on call every other night and every other weekend. That schedule nearly always required him to go into the office, with Sunday mornings as the busiest after-hours time, he said. In recent weeks, Dr. Pierce said he’s had flashbacks through the years of checking up on local kids with their families, diagnosing what ails them and treating those illnesses. Pierce said he recognizes that his retirement impacts his life as well as the lives of New Canaan families accustomed to seeing their longtime physician. While Dr. Pierce wasn’t our primary doctor, between our three kids, and many ailments, we had the fortune of seeing him numerous times. So appreciated his kindness and experience. Wishing him a happy “next chapter”! As a grandmother of 7 grandchildren in New Canaan, I have been to see Dr. Pierce with all of them! He has been a great pediatrician and will be missed by many. Kindest wishes fir an abundantly happy and healthy retirement! When our 6 yr old daughter was hospitalized with pneumonia Dr. Pierce came to the hospital at 10:00pm in the evening and was there again the next morning at 6:00am. He was filling in for our dr who was on vacation. We were taken aback by his care and dedication. His genuine character is not something they can teach in med school. He is that rare combination of professionalism and kindness that our entire community has benefited from. Dr. Pierce has taken care of all 5 of my children for over a decade. He has seen us through several hospital stays, late night phone calls, food allergies, pneumonia (multiple times), stitches and severe asthma. He has always gone above and beyond. He is a great doctor and friend. Thank you Dr. Pierce! Dr. Pierce is a remarkable physician and we will miss him greatly!!! As a patient of Dr Pierce in the early 80’s and father of two “second generation” patients: Thank you for what you have done for our family and community. Thank you Harrison for taking such good care of our children and everyone else’s ! 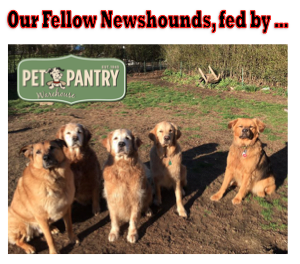 We so appreciate you and have also enjoyed knowing and spending time with your family over the years. Stop by to see us in Portsmouth NH on your retirement travels. Dr. Pierce was wonderful for the few years I lived in New Canaan in the 80’s. I remember being exhausted and scared when Megan wasn’t staying awake (dehydration I believe) and he made arrangements for me to take her to the hospital. I wish living in New Canaan and having the best pediatrician could have been longer but that’s IBM.